"Canine cough is a problem that refers to irritation in a dog's lungs, throat or airways. Problems may involve the part of the lungs that carries air, the trachea or windpipe, and branches off of the lungs called bronchi. When the cough occurs the sound of the canine cough, such as a snort or wet and raspy sound, can indicate its underlying cause as indicated below. Possible causes include allergy, infection, heart disease and parasites. Dog cough treatment depends on the underlying cause and usually involves a cough suppressant, treatment for bacterial infection with antibiotics, or steroids, as in the case of allergy. Be sure to consult with a veterinarian if cough lasts greater than 24 hours." Canine and cough occurs when a dog’s throat, airway or lungs are irritated. There are so many causes of a cough that it is tricky to determine its exact cause. The range of causes includes irritation in the branches of the lungs (trachea or windpipe) to heart disease (associated with heart rhythm issues). The causes of the cough also varies by breed, age and size of your dog. 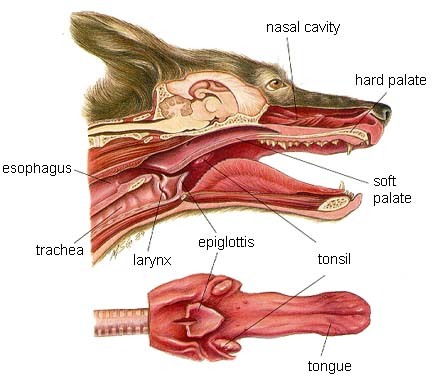 It is helpful to understand the anatomy of the canine respiratory system when diagnosing and treating canine cough. Dog coughs more at night vs. during the day: Dogs that cough more at night indicates that possible problems could include heart failure, a trachea that is collapsing and lung edema. Canine coughs when dog is excited or when tugging on collar: a coughing in dogs when this occurs indicates irritation in the dogs trachea or tracheal collapse. Cough in dogs after excitement or exercise: this indicates a dog cough problem due to heart disease. Dog coughs after drinking water: this could indicate a problem with the trachea such as tracheal collapse. Canine coughs after eating: a cough in dogs after eating indicates a problem with the esophagus or larynx. 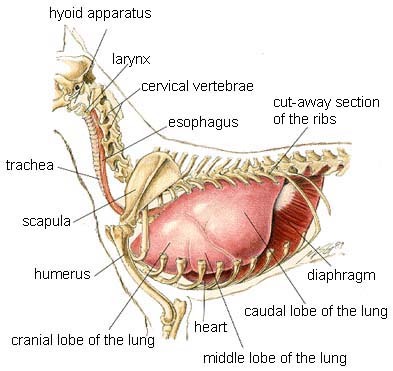 A normal functioning larynx closes when eating to stop food from going into a dogs trachea. When a larynx isn't functioning properly such as when there is a larynx disease, the larynx doesn't fully close, which allows food to move into the trachea. This food collects in the esophagus, causing it to dilate or expand. Food then moves into the mouth and the dogs airway, which results in dog cough and possible pneumonia. Moist coughs: if a canine cough sounds moist, it indicates that water, blood or pus has accumulated in the lungs or airway. The underlying cause of this accumulation would need to be determined. Cough frequently when outdoors: dogs that spend time outdoors may suffer from canine and cough due to foreign materials such as grass or seeds which get into the nose and airway. These materials may enter the lungs and cause a dog lung infection. They may also cause pus to accumulate in the areas that surround the lungs (called pyothorax). Cough when exposed to other dogs in shelters: If a dog contracts a cough after being with other dogs or in a shelter there is usually an infection as an underlying cause of the dog cough problem. Young Dogs and Cough: Cough in younger dogs is often caused by some type of bacterial or viral infection. Older Dog and Middle Age Dogs With Cough: Cough in these dogs may indicate heart problems as an underlying problem such as heart valve leaks. It could also indicate canine lung cancer. Overweight Small Breed Dogs: Cough in smaller dogs that are overweight can be caused by tracheal collapse (can sound like a honking goose). Treatment involves having the dog lose weight, and medications such as cough sedatives and suppressants. Surgery is also sometimes an option. Large Breed Dogs: larger dogs can suffer from paralysis of the larynx. The symptom of canine tuberculosis is moist and labored breathing in addition to cough. Dogs tend to contract the disease through inhalation. Canine Tuberculosis can spread from humans. It is difficult to diagnose and is often not treated. Diagnosis is based on a combination of tests including x-rays (check lungs), blood tests (white cell count) and an assessment of overall health. Many strains are anti-biotic resistant. Heartworms: These dog worms are transmitted by a mosquito that first bites an infected dog. The mosquito then transfers the parasites (called microfilariae) from the infected dog to another host dog. This condition is suspected as the cause of cough in regions where there are large populations of mosquitoes. The disease usually takes 6 months to take hold. The dog starts to cough due to restricted blood flow to the heart. Even a simple walk from one part of the house to the next could result in a cough. Common treatment is a tablet taken year round to prevent heart worm and other worms such as whipworm and hookworm. Roundworms: These types of worms reside in the dog’s intestine. Dogs come in contact with the larval worms when they lick or ingest soil. Puppies can get the disease from mothers milk. Worms are 3 to 5 inches in length. The worms move into the lungs, windpipe and then are ingested into the intestine. You can tell if your dog has roundworm if they vomit up a worm (they are long and white), has a bout with diarrhea, or by testing the feces. Roundworm is easily treated through over the counter medicines (ivermectin as in HeartguardTM) or prescription such as fenbendazole (Panacur Rx). Distemper (virus): A dry canine cough can be a sign in the first stage of a disease called distemper. Other symptoms include listless behavior, fever and a yellow discharge from the nose and eyes. Most dogs receive a vaccine to avoid this disease. Puppies are at risk until vaccinated. Dog that have canine distemper have a high 80% mortality rate (rate of death). Fungus: in certain parts of the country, fungal infections of the lungs can trigger cough in dogs. These condition are referred to as histoplasmosis, coccidiomycosis and blastomycosis. Kennel Cough (infectious tracheobronchitis): Kennel cough is the result of a bacterial or viral infection. Cough as a symptom occurs several weeks after a dog has been exposed to other dogs in a kennel or in a dog show. The disease usually goes away on its own in 7 to 14 days. In cases of chronic or severe canine cough, cough suppressants are used to reduce the impact of symptoms. If the cough continues past the 14 day mark, then a veterinary evaluation is needed of the airways or lungs. Like humans, canines can develop cough as an allergic cough to pollen, dust, mold, smoke and insect bites. These can be life long conditions and there is no cure. If you can't remove the allergen from the dog's environment, immunitherapy (allergy shots) can be used. In this approach, the dog is injected with small and over time increasing dosages of the allergen in order to improve tolerance. Immunitherapy works for approximately 75% of dogs. To diagnose heart disease your Veterinarian will do an electrocardiogram, a heart ultrasound to see inside the heart. Your dog's veterinarian will look for an enlargement of the heart, a condition that places pressure on the airways, causing the cough. The pressure may result in heart failure or a condition called lung edema. Lung cancer in dogs is usually secondary in nature, where cancer cells are carried from another part of the body which has cancer to the lungs. Treatment involves medications which target this type of cancer. Surgery is also used to remove any tumors that are found in the lungs. Treatment for cough in dogs depends on the underlying cause. Medications can suppress coughs, and antibiotics for infection are used. Steroids are used for allergy. While the underlying cause for a cough is being determined, natural remedies can be used to reduce the severity of a cough and to strengthen the immune system of the dog. Products like KC-Defense can be used to calm the throat and chest and help speed the relief from symptoms such as a dry cough or hacking cough. Other remedies such as Immunity and Liver Tonic help to improve immune system health. These are not cures, but can provide some relief. Replacing a leash with a harness: If a dog is too eager, the leash collar can place pressure on the larynx, which can cause a cough. Use a Cough Suppressant: Ask your veterinarian about a cough suppressant that contains dextromethorphan such as Robitussin Maximum Strength Cough Syrup. Do not purchase products which contain other ingredients such as aspirin or acetaminophen. Check with your veterinarian for dose. Use an Antihistamine: The ingredient diphenhydramine (Benadryl) might bring some relief to dogs. Check with your veterinarian for the dose which is usually 1 milligram per pound of your dog's weight. Use Honey for dog cough: Providing a tablespoon of honey to your dog, every 3 to 5 hours, can soothe the throat and eventually help put a stop to cough caused by irritation.